Many times, pet owners face difficulty in finding out their lost pets. When a pet is lost, the owner just starts looking for their furry friend here and there everywhere relentlessly. It makes their life more miserable. 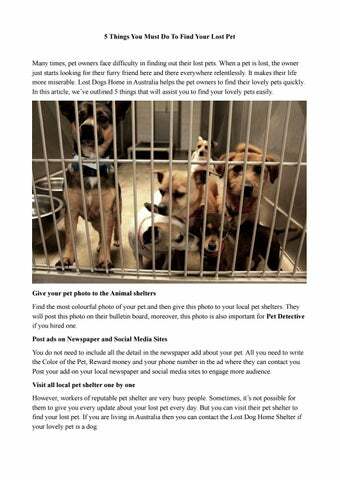 Lost Dogs Home in Australia helps the pet owners to find their lovely pets quickly. In this article, weâ&#x20AC;&#x2122;ve outlined 5 things that will assist you to find your lovely pets easily. Give your pet photo to the Animal shelters Find the most colourful photo of your pet and then give this photo to your local pet shelters. They will post this photo on their bulletin board, moreover, this photo is also important for Pet Detective if you hired one. Post ads on Newspaper and Social Media Sites You do not need to include all the detail in the newspaper add about your pet. All you need to write the Color of the Pet, Reward money and your phone number in the ad where they can contact you. Post your add on your local newspaper and social media sites to engage more audience. Visit all local pet shelter one by one However, workers of reputable pet shelter are very busy people. Sometimes, itâ&#x20AC;&#x2122;s not possible for them to give you every update about your lost pet every day. But you can visit their pet shelter to find your lost pet. If you are living in Australia then you can contact the Lost Dog Home Shelter if your lovely pet is a dog. Run an announcement on local radio and TV If you love your pets more than anything then you can make an announcement of your lost pets on local radio and TV. Announce the big reward Announce the big reward for whoever will help to find your pet. Do not try to be skimp when giving reward money to any pet detective or lost dog home service if they helped you to find your pet. 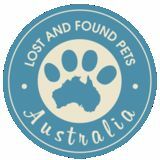 Where to find the lost pets in Australia! If you are looking for pet finder organization in Australia, then register on http://www.lostandfoundpetsaustralia.com . This is a trustworthy company to find your pets. So, what you are waiting for? Call them now!